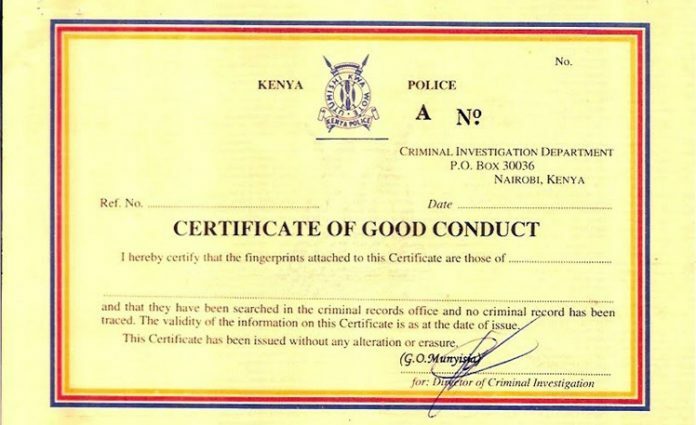 The Police Clearance Certificate is a requested document in most institutions in Kenya. Banks, employers, insurance companies, government agencies require you present certificate of good conduct when you transact with them. N/B If you are in Nairobi you can only apply for the certificate of good conduct online for those outside, skip the online procedure and head to a CID office near you. Head to the CID offices with a copy of C24, the invoices and original ID for adults or Birth certificate for minors. Click here for a map to CID Headquarters. Those in Nairobi, you take a matatu number 100 from OTC area stage. Alight at the CID headquarters. Follow instructions from the CID officers to get your Police clearance certificate.